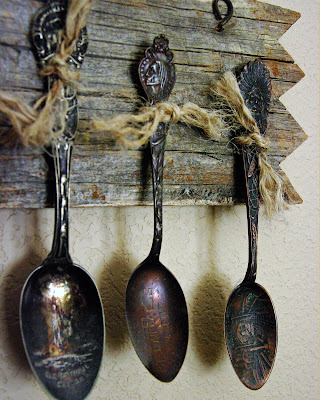 A collection of spoons from Ken's mom that was given to him. Most of them souvenir spoons. For years we didn't know what to do with them, so we kept them wrapped up in his box of memories. Then a friend of mine gave me this piece of wood and they just fit perfectly. 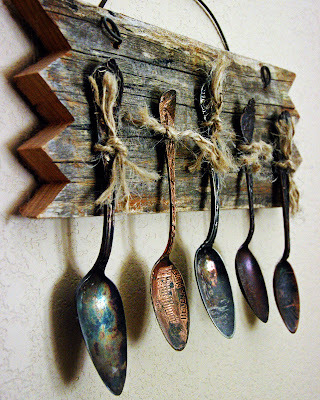 With the help of some small tacks, I tacked each piece of jute on then tied the spoons on. Now they hang in our house as a memory of his mom. We would love to know the story behind each one and what it meant to her. 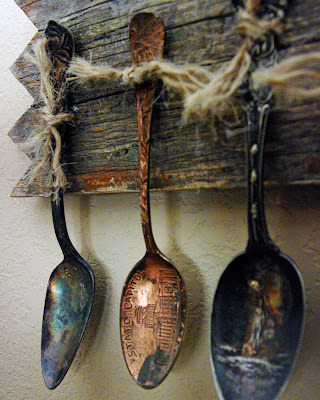 For now we can only guess and cherish these spoons as they are a precious piece of his mom. Love this and so unique!